The Northwood Memorial, 4531 Bryan Ave.
Join the City of Laguna Niguel on Tuesday, November 11 from 11:00 AM to12:30 PM at Sea Country Senior and Community Center, as they honor all those who served in our Armed Forces. For more information, please click here. The El Toro Memorial Park Committee invites you to the annual Veteran’s Day Program at El Toro Memorial Park, 25751 Trabuco Rd., Lake Forest. The program on Tuesday, Nov. 11 at 11:00 AM. The Veteran’s Day address will be given by 1st Lieutenant Frank Pangborn, 1st Air Calvary Division, Vietnam. The program will include music provided by vocalist, John Huntington. The event is free to the public and will take place rain or shine. For more information, please contact the cemetery at (949)951-8244. In honor of Veterans Day, the Saddleback College Foundation, the Student Veterans Club, and the Veterans Education and Transition Services (VETS) will host events next week – leading up to the Second Annual Chili Bowl Festival on Thursday, November 11. 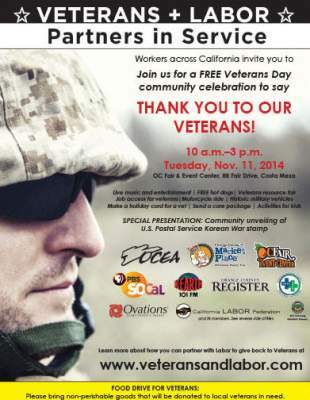 The Chili Bowl Festival is from 11:30 a.m. to 2:00 p.m. at the Saddleback College Veterans Memorial. The festival will raise money for VETS student scholarships and support. The $30 entry fee includes a chili lunch, donated by Chili’s Bar & Grill, sides, drinks and dessert. Guests will have the chance to participate in a 50/50 raffle. Tickets are available by contacting the foundation office at 582-4479. Please click here for more details. Veterans Memorial at Depot Park, 100 N. Atchison St. The community and all veterans and their families are invited to commemorate Veterans Day on Saturday, November 8 at 1 pm at the Marine Monument in San Clemente at Park Semper Fi located in the Pier Bowl. For more information, please click here. Join the City of San Juan Capistrano in honoring our nation’s heroes at the Annual Veterans Day Ceremony hosted by VFW Serra Post 3801 at Veterans Park on November 11 at 10:45 AM (refreshments provided), followed by a BBQ and live entertainment at Historic Town Center Park. For more information, please click here.